My Christmas “wish list” is growing longer and longer! I just can’t help myself, every time I find a new Gingerbread themed item my heart goes “yippee” as if I were a child but am actually a grown woman. I have not seen one like before. This particular Italian charm would be fabulous on my charm bracelet, or even a necklace. 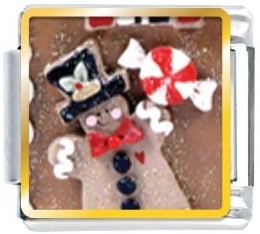 This Gingerbread man and candy food photo Italian charm is a total must have for the Gingerbread fanatic like me. Visit here!